PATENT TECHNOLOGY-Fortifies and strengthens the hair resistance from root to hair ends, for a healthy-looking hair. Hair Thickening technology a powerful patented mixture that appears to help premature hair loss by creating a natural balance in the scalp. Fortifies thin or thinning hair and maintains hair density. Contains a multi-functional combination of effective ingredients that creates an environment that may help to prolong your hair growth phase, Revitalizes hair by penetrating the hair from root to tip with nourishing hair nutrients. In Vivo Clinical Study of 35 male volunteers with hair loss, applied twice daily a hair lotion with 3% BETOFIX™ (18 volunteers) or a placebo (17 volunteers) for 4 months. The proportion of hair in the growth phase of the hair and in the resting phase of the hair has been evaluated and measured. Hair bulb cells are highly structured and differentiated. The root sheath appears thicker which helps optimum anchoring! During the 4 months the ratio increases significantly by up to 46%, compared to day 1 and the placebo. With *BETOFIX™, 67% volunteers were happy with the results! (2 ppm) stimulates Ki-67 expression, indicating enhanced cell proliferation. Laminin 5 and Collagen IV are revealed by immunofluorescence. After 4 months of treatment, hair bulb cells are highly structured and differentiated. To keep your hair looking its absolute best every single day, you cannot rely on monthly treatments that gradually wear o. Healthy hair is an everyday endeavor that starts with using the correct shampoo and concentrated ampoule that provide the proper combination of moisture and protein to your hair. 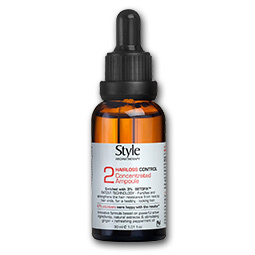 HAIRLOSS CONTROL Shampoo & Concentrated Ampoule recognizes this unique need and addresses it by incorporating deep cleaning agents which also tend to dry hair. This allows you to repair, build and maintain the optimal protein structure of your hair on a daily basis rather than attempting to do so through irregular treatments. Instantly eliminate the appearance of baldness and thinning hair. Keratin Fiber won’t come off in wind, rain or perspiration. It is totally undetectable, even from as close as two inches. 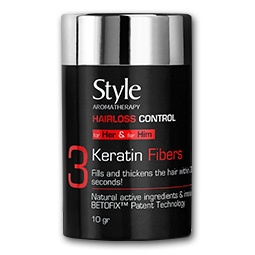 Keratin Fiber stays securely in place giving natural-looking thickness and fullness until the next time you shampoo. 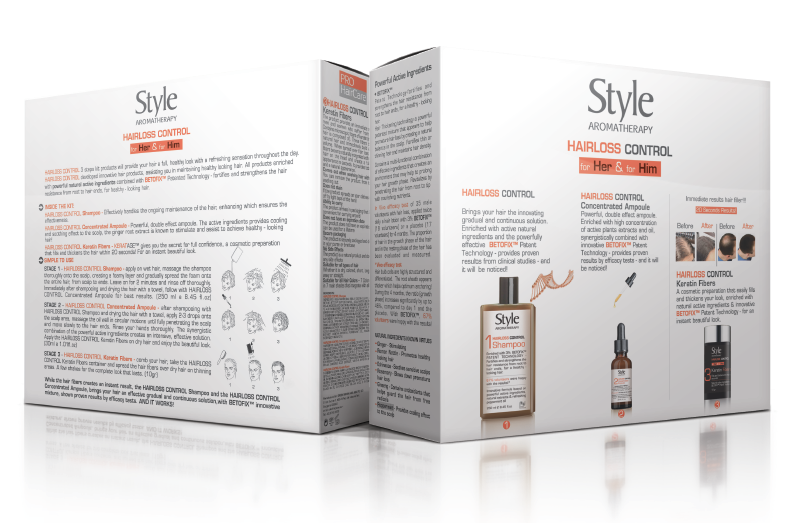 It is compatible with all hair products and is great for both men and women. 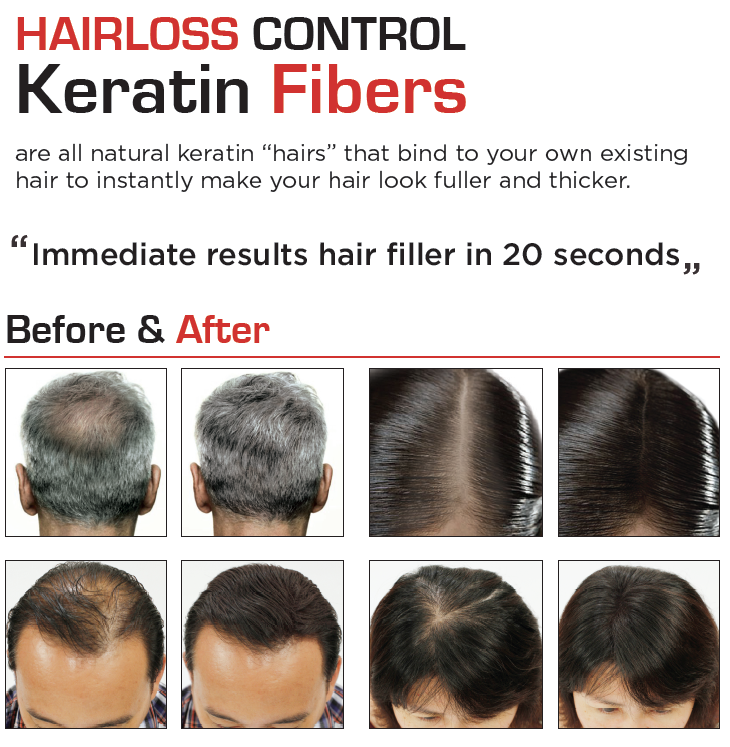 Keratin Fiber is completely safe and works amazingly well with hair transplants. No matter what your condition, if you are concerned about visible hair loss, it will change the way you feel about yourself every time. The product does not have an expiration date and can be used for a lifetime. 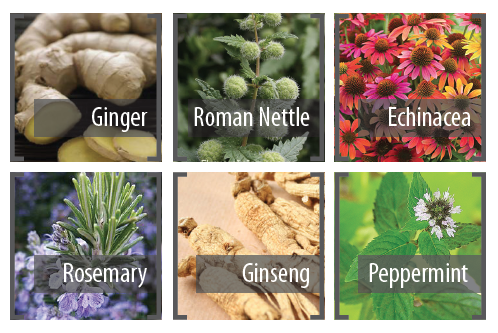 The product is suitable for all types of hair, whether it is dry, colored, short, long, curly, wavy or straight. The product is securely seal and does not spill off easily in your bag. 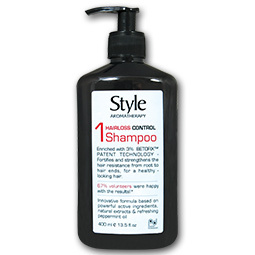 You can remove the product from the hair by simple shampooing.